Hello friends! How are you doing? I am pretty fine myself. Been quite busy with work until i have no time for myself. Hehe. Well, although i am very busy with my work, cleanliness is something that i must not overlooked at. I can call myself a hygine freak. I always wanted my hands to feel clean. I dont really like reading newspaper because of the carbon as after reading it, i need to go and wash my hands. But now i can read news paper and play with my cats without having to think that i need to go and wash my hans because i have my trustie pocketbac with me! As a hand hygine freak, i always clean up my hands very regularly. Even if i think that my hands are clean enough, sometimes it does not. I dont like dirty feeling hands because i tend to touch my face a lot and if my hands are dirty from dust or others, whenever i touch my face it'll leave some itcy feelings on it. And i super hate it! Thanks to Bath & Body Works PocketBac, i can now have an instant clean hands! Just by having the pocketbac near me, i am all safe. Let's share what is you favorite scent? I ❤ Aqua! Paris Amour is a bit sweet for me. Dont really like it that much but it has glitters in it! The others i have not tried them as yet! 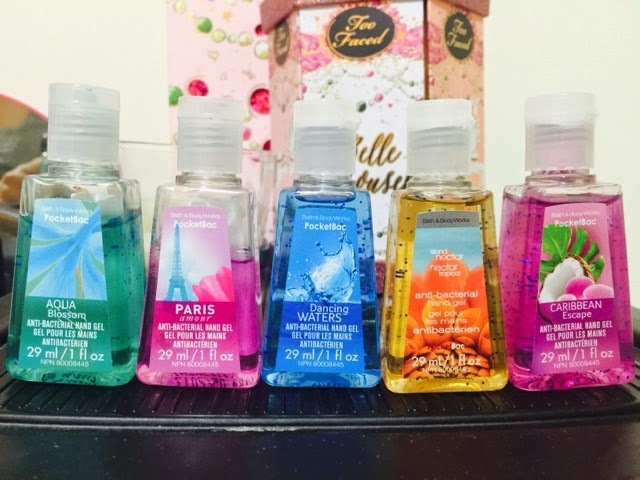 I purchsed these at Bath & Body Works shop in Nu Sentral. Each costs RM12 and if you buy 3 pieces, it'll costs RM30.